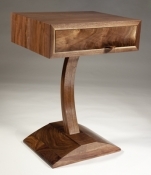 Featuring American Black Walnut from Staatsburg, New York. The piece features an ample solid wood drawer with hand cut dovetail construction and hand-carved drawer pull. The finish is hand rubbed oil and wax. As always, a Provenance Passportâ„¢ accompanies each piece of furniture and tells the story of the tree from which it came.